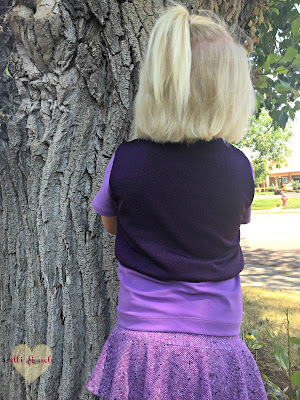 I hardly find time to blog anymore, but I wanted to do the Sew Back to School tour with Lulu & Celeste and Sprouting JubeJube, especially when I saw the list of designers sponsoring patterns! 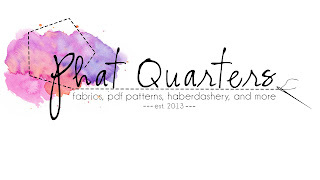 While I used a couple that I owned already from Gracious Threads, I also am really grateful to Phat Quarters, Sofilantjes, Filles à Maman, and Jalie for donating patterns to me for this post! Sofilantjes and Filles à Maman were not new to me, but the other two I hadn't tried yet, and I am pleased to say I have two more companies to add to my list of "loves". 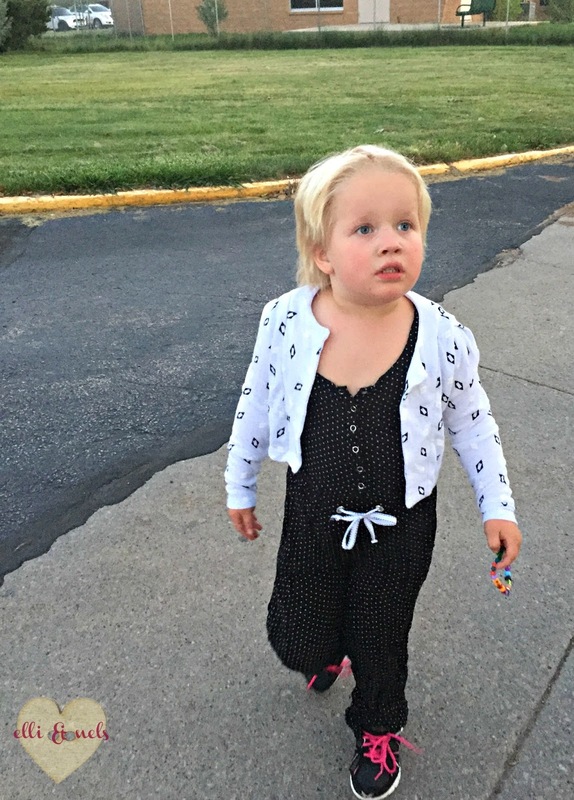 My first "outfit" kind of ended up all over the place, but trust me when I say it's right up this girl's alley. She is fun, snappy, and silly all rolled up in a ball, and loves every piece I made. The mock turtle top and pretty vest are Gracious Threads' patterns that I owned previously, and hadn't had the chance to make. 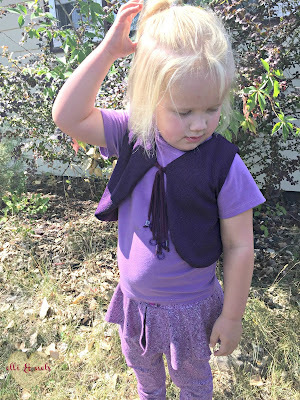 When I was looking for a simpler top that would stand on its own but not outshine the beautiful Glacier Vest, the Chestnut Tee seemed the obvious choice. 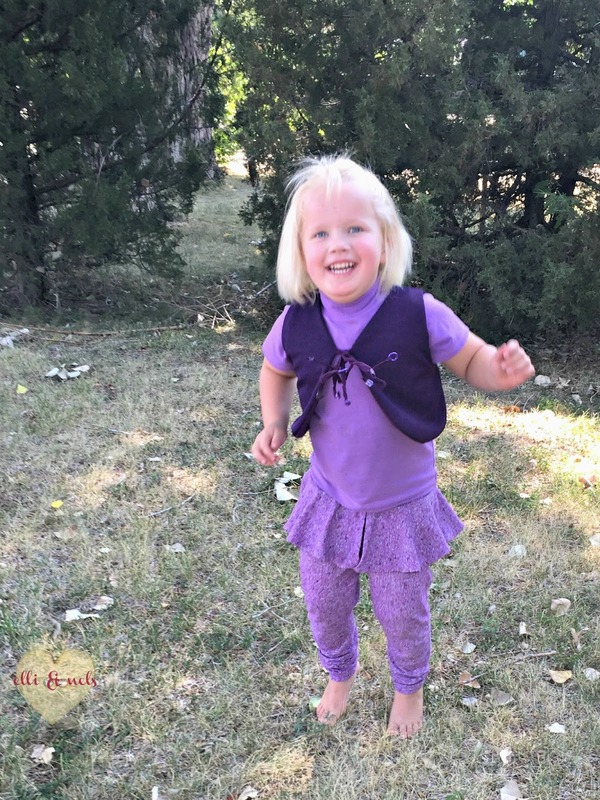 Mock turtlenecks are my favorite on little kids! The Chestnut has quite a few different options; I went with short sleeves because I wasn't sure how cool it would be yet, and a simple cut. 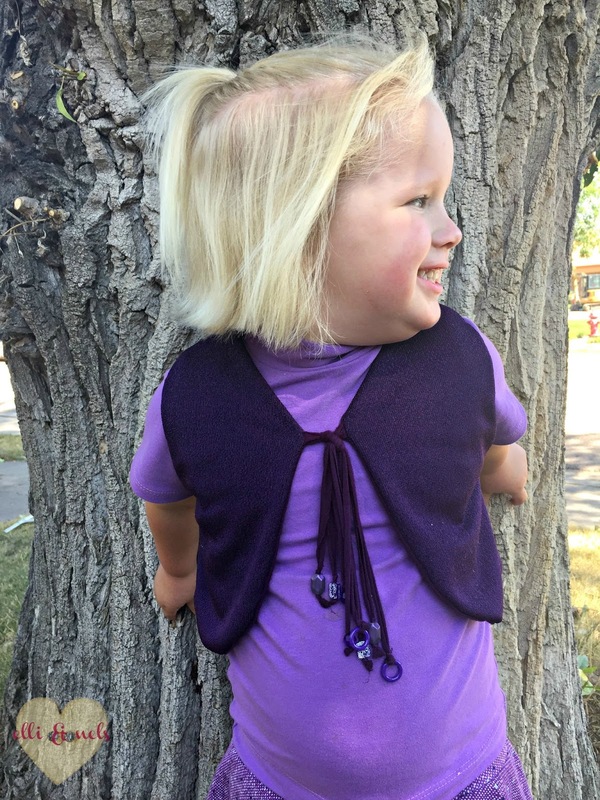 The vest is intended for fun, fancy fabrics like faux fur (how about that alliteration! ), and this stashed sweater knit (I don't even remember where it came from!) and pretty beads just pop. I lined it with some rayon spandex from Pretty Posh Prints, using thin strips of the same for the ties. Threading the beads with a darning needle was a challenge, but it got done and I'm so pleased with the result. The Poppy Peplum Pants were kind of an impulse request but I'm so glad I did. They're really so much fun, and speak to Miss 4's personality perfectly. They have a "loose legging" fit, so perfect for school, and the peplum is a great way to add some flair to not-so-ordinary pants! 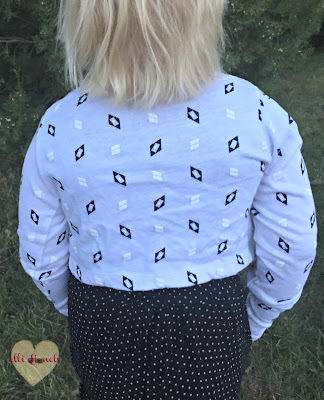 That amazing houndstooth pattern cotton spandex is Girl Charlee's Bolt line, and the peplum is lined with more of the luscious rayon spandex (PPP). 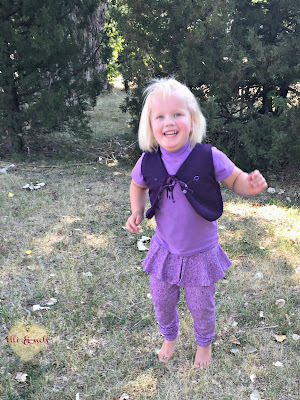 I rarely buy purple fabrics, and I was delighted to find a few on my shelves that I could throw together! It's Sam's current favorite color, so she's more than pleased. The second outfit is the one intended for my oldest, but here's where it got tricky. I mashed a couple of patterns that I hadn't made before, and - I didn't muslin. I know, I know. I did put a lot of thought into it, and it does fit Sam (besides being too long, but that's okay/an easy fix). Nonetheless, I'm SO happy with how it turned out. 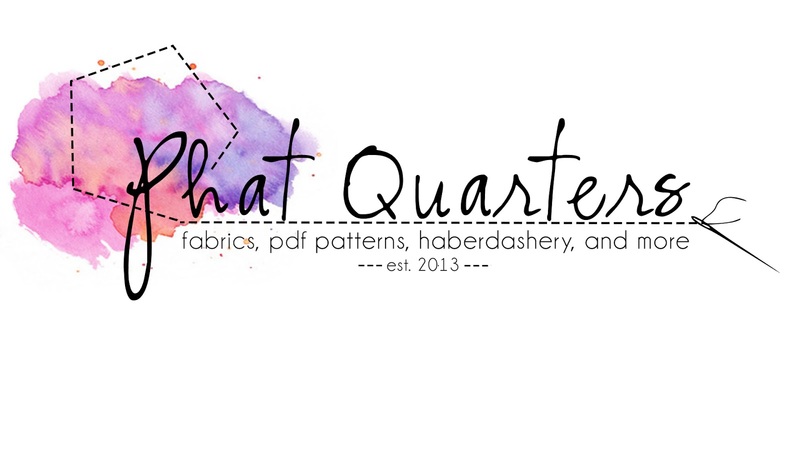 I love the idea, and I know I can (and will!) do it again, knowing what I know now. Recognize anything? The top is a sneaky use of the Camellia from Phat Quarters, with a simple facing added, collar removed, and button placket shortened just a bit. (I will lengthen the bodice just a touch next time I do this!) There are metal snaps in lieu of buttons. The bottom half is Jalie's Vanessa Fluid Pants pretty much in their entirety; I really didn't do much different with that pattern. The waistband is sewn as written except I used two pieces instead of a folded piece, and attached the top raw edge to the Camellia bodice! 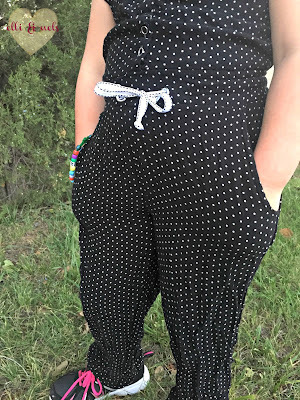 The placket makes getting this jumpsuit on and off very easy. I am so in love with drawstrings (here I used a piece of ribbon I've had for years) and the grommets make it look polished. The elastic is great for ease of fit, and my flowy rayon dot crepe (LA Finch) is the perfect fabric! So soft and dreamy, and way easier to sew up than I was expecting. 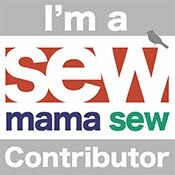 I need to work with finer apparel wovens more. The jumpsuit needs a topper, and the Aura Bolero is just right. I love (lovelovelove) princess seams; they are so attractive and take a garment "up" just a bit. 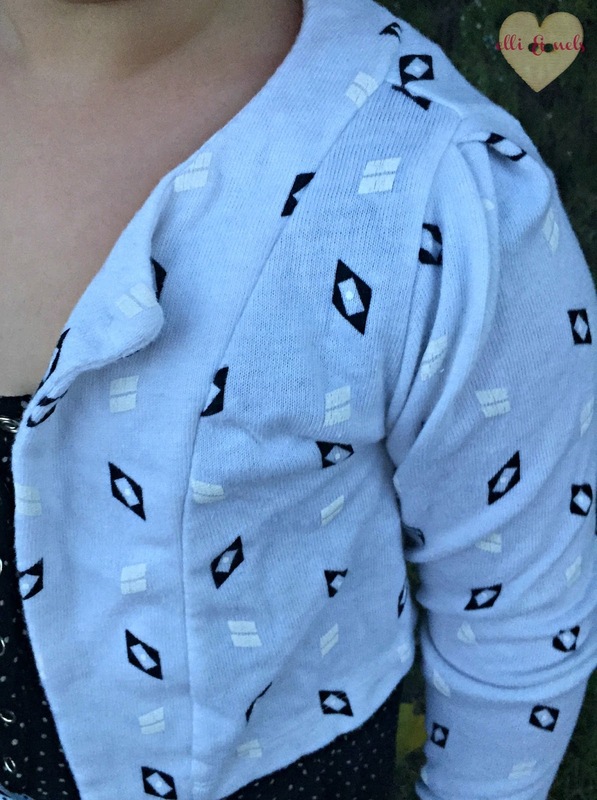 A simple button/loop closure at the neckline, and this lined cardigan is a surprisingly quick but polished finish to an outfit. I was going for playful but sophisticated, and Sam's hair (a DIY, not by me either) gives it an "edge" - yeah, we'll go with that. (LOL. Kids are fun, right?? Also note that her hair was NOT "edgy" for the other outfit - I guess we "planned" that pretty well, taking the pictures at different times! 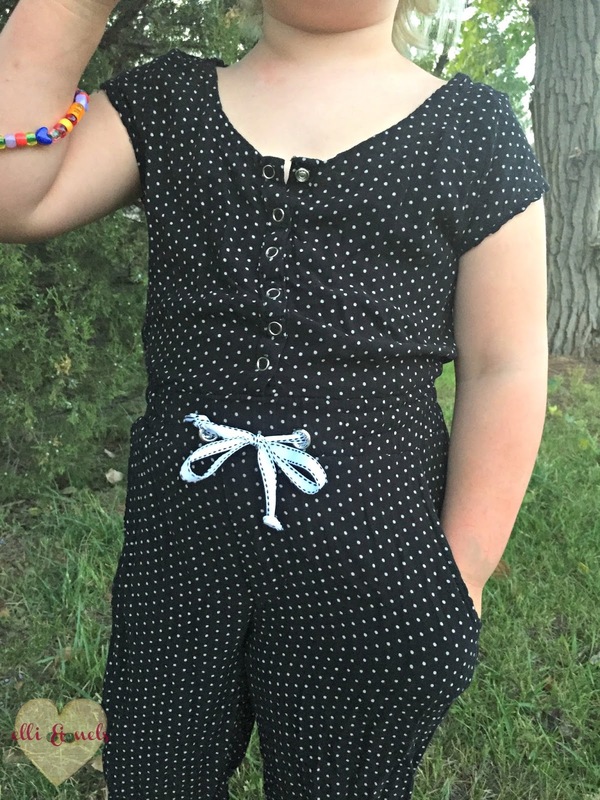 While rompers aren't the most practical things for school in general, we're now homeschooling and since Sam is in a short day preschool, I think it works! The sweater is perfect for our cooler evenings, should we be out and about, and the vest adds a layer for chilly but sunny mornings when you just can't bring yourself to put on a coat! I had so much fun with these outfits - keep following our tour to see the other "back to school" looks! I love rompers!!! I wish they were more practical for school too! Look at that pretty girl! You made her lots of great new garments. Thank you! She is so great :D Even with her DIY haircuts. LOL.